Srinagar, Feb 9: Over 3000 vehicles, mostly trucks, are stranded following the closure of the Srinagar-Jammu National Highway, the only all-weather road connecting the Kashmir valley with the rest of the country, for the fourth day on Saturday due to landslides and shooting stone, official sources said. A massive rescue operation was going on at Jawahar tunnel, where one policeman was still missing after a snow avalanche hit a police post on February 7, Bodies of seven persons were recovered while two were rescued alive. 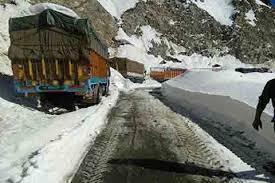 The Ladakh region remained cut off from Kashmir since December last year as the Srinagar-Leh National Highway remained closed due to an accumulation of snow while historic 86-km-long historic Mughal road and Anantnag-Kishtwar roads remained shut due to the accumulation of several feet of snow and slippery road conditions. Traffic on the highway remained suspended on the highway for over three weeks in 2019, leading to a shortage of essentials, including vegetables, meat, chicken besides petrol and diesel in the Kashmir valley, which is totally dependent on imports from different northern states. Sources said over 3,000 vehicles, a majority of the trucks, are stranded on the highway for the past over a week. Several thousand Kashmiri passengers are also stranded in Jammu due to a closure of the highway. Traffic could not be resumed on the Srinagar-Jammu national highway due to fresh landslides and slippery road conditions, a traffic police official told TNN. There were fresh landslides and shooting stones at Peedah and Cafeteria Mode this morning, he said, adding that frequent shooting stone and landslides have forced authorities to suspend traffic. He appealed to people not to undertake foot journey in the avalanche-prone area which could prove dangerous. Two people were killed and three others were injured when they came under a landslide at Ramban in Jammu region after they tried to cross the danger area on foot yesterday. He said the National Highway Authority of India (NHAI) and Border Roads Organisation (BRO), responsible for the maintenance of the highway, are working round the clock to make highway traffic worthy. However, he said, frequent landslides and shooting stones are occurring at several places on the highway between Ramban and Ramsu. The National Highway, connecting Ladakh region with Kashmir, also remained closed since December last year. There was fresh snowfall on the highway, particularly between Sonamarg-Zojila pass-Zero point-Meenmarg, which was already under several feet of snow. Fresh snowfall was also received on historic 86-km-long Shopian in south Kashmir and Rajouri and Poonch in Jammu region. The road is also closed since December last year due to an accumulation of several feet snow and slippery road conditions. The Anantnag-Kishtwar road also remained closed for the past over two months.